Have you ever tried Fevi Stik? Yes, the one you use to glue your broken things – a drop of glue and it’s new like never broken before. I guess it worked all the time. Apparently, glueing a team together is not that easy. It is a lot of brainstorming and became a big job for many offices. God knows the pain of Human Resource department and, to some extent, manager for accomplishing the hard task. With many startups turning into Small Medium Enterprises (SMEs), team building and bonding become a headache, especially in limited funds. The paintball game is a strategy-based game played between two teams. You can easily mix and match the people in the teams that ultimately give a chance for one to gel with every other member the team. It makes people understand the mindset, team dynamics and capabilities each one brings in the group. Raft Building can include n number of people. The instructor would guide on how to assemble the raft with kayak boats, logs, ropes, tubes and some raw materials. The member of the team has to actually communicate and be attentive to create a raft from the scratch and that should work as well. Ultimately, the team can test their raft by heading to the water. 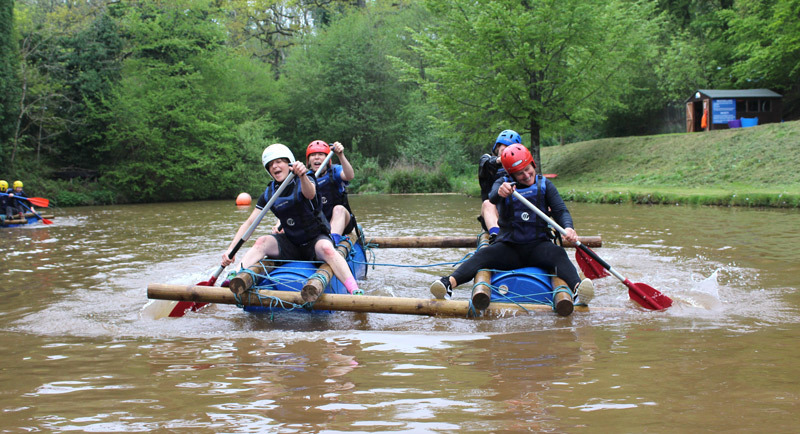 The warlike situation in a building a raft can sometimes competitive and generate positive synergy in the team. Building a raft and rafting on backwaters of Arkavathi River near Manchanabele reservoir can be an awesome experience for corporate people. The Zip Line, however, is an individual activity in which a person is clamped on the rope to slide from one spot to another distant spot. The rope will be mounted in a certain height. This thrilling sport could help reduce lots of fear from one’s heart and make them a little bold. When we are talking about swimming, it’s not professional swimming exercise. Swimming here is about a bunch people who push themselves in the river just for the fun, relaxing and friendly time. The activity opens people up to talk beyond their work, laugh at their jokes and ultimately and spend some quality time in the group. The Kayaking is about practice and learning with water flow. The person on kayak boat has to understand the mood of the water and act upon it to move the boat forward. Sometimes, the kayak boat is for two people that forces the additional responsibility to work along with the partner. This is a group ride to the extreme end of the river with a boatman and a few of your fellow colleagues. Riding on Coracle boat finds some of the spectacular moments during the jolting and jovial period. Just like the Zip Line, Rappelling is an individual activity serving a purpose of conquering your fear. It makes vulnerable for certain period and at the same time, makes you learn to live in the moment and complete the task at the hand. The activity also teaches how to trust on a completely unknown person, who is holding the rope for you. Very often, people consider the walking a mundane activity but there is nothing that can surpass the pleasure of walking amidst the hillocks to explore big landscapes and forests and reach to the top of the hill for the spectacular view. The trekking brings people together to walk to the same destination. During the long hours of the stroll, it’s natural to have a small or big talk which is required for open communications. If you are looking for one of the ideal trek activities near Bangalore, Manchanabele Reservoir provides the perfect environment. The game is simple: You have a gun or bow, fire it and the bullet or the arrow should hit the mid-point of the board kept at a distance. Target shooting is not about perfection but enhancing the concentration with each shot. In any of our trips, our expert team ensures your safety and technical assistance while you learn to gel with your team in many different adventure sports. Escape2Explore provides all 9 team building activities in its package, Manchinabele Team Outing with Adventure Activities. 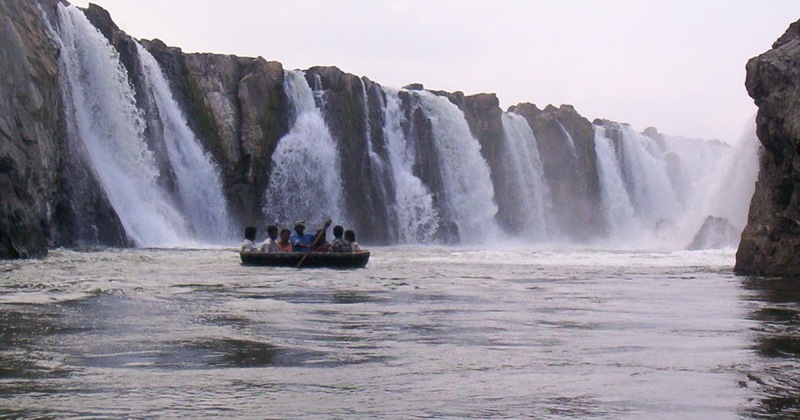 Manchanabele Reservoir is around 60 kms from the city and considered to be one of the best places to visit in Bangalore. Now you can book this package at a lower rate. Play More, Pay Less.